This page refers to the Afrikaner Broederbond. For its later incarnation see Afrikanerbond. For the political party formed in 1881 by Rev S.J. du Toit, see Afrikaner Bond. For the unrelated company, see Brøderbund. 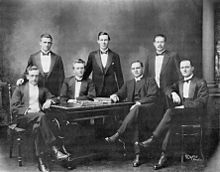 The Afrikaner Broederbond (AB) (meaning Afrikaner Brotherhood) or Broederbond was a secret, exclusively male and Afrikaner Calvinist organisation in South Africa dedicated to the advancement of Afrikaner interests. It was founded by H. J. Klopper, H. W. van der Merwe, D. H. C. du Plessis and Rev. Jozua Naudé  in 1918 and was known as Jong Zuid Afrika (Young South Africa) until 1920, when it became the Broederbond. Its large influence within South African political and social life, came to a climax with the rise of apartheid, which was largely designed and implemented by Broederbond members. Between 1948 and 1994, many prominent figures of South African political life, including all leaders of the government, were members of the Afrikaner Broederbond. for understandable reasons it was difficult to explain [our] aims…[I]n the beginning people were allowed in…who thought it was just another cultural society. The precise intentions of the founders are not clear. Was the group intended to counter the dominance of the British and the English language, or to redeem the Afrikaners after their defeat in the Second Anglo-Boer War? Perhaps it sought to protect a culture, build an economy and seize control of a government. The remarks of the organisation's chairman in 1944 offer a slightly different, and possibly more accurate interpretation in the context of the post-Boer War and post- World War I era, when Afrikaners were suffering through a maelstrom of social and political changes: The Afrikaner Broederbond was born out of the deep conviction that the Afrikaner volk has been planted in this country by the Hand of God, destined to survive as a separate volk with its own calling. In other words, the traditional, deeply pious Calvinism of the Afrikaners, a pastoral people with a difficult history in South Africa since the mid-17th century, supplied an element of Christian predestination that led to a determination to wrest the country from the English-speaking British and place its future in the hands of the Afrikaans-speaking Afrikaners, whatever that might mean for the large black and mixed-race population. To the old thirst for sovereignty that had prompted the Great Trek into the interior from 1838 on, would be added a new thirst for total independence and Nationalism. These two threads merged to form a "Christian National" civil religion that would dominate South African life from 1948 to 1994. This was the historical context in which the Broederbond emerged. The scorched earth policy of the British during the second Boer War devastated Boer (that is, rural Afrikaner farmer) lands. In British concentration camps, 27 000 Boer women and children had died. The Boer surrender at Vereeniging, though pragmatic, was deeply humiliating. Lord Milner's inflammatory policy of Anglicisation simply rubbed salt into Afrikaner wounds, and a backlash was inevitable. The National Party and ultimately the Broederbond were the long-term and powerful results. The National Party had been established in 1914 by Afrikaner nationalists. It first came to power in 1924. Ten years later, its leader J. B. M. Hertzog and Jan Smuts of the South African Party merged their parties to form the United Party. This angered a contingent of hardline nationalists under D. F. Malan, who broke away to form the ’’Purified National Party’’. By the time World War II broke out, resentment of the British had not subsided. Malan's party opposed South Africa's entry into the war on the side of the British; some of its members wanted to support Nazi Germany. Jan Smuts had commanded the British Army in East Africa in World War I and was amenable to backing the Allies a second time. This was the spark Afrikaner nationalism needed. Herzog, who was in favour of neutrality, quit the United Party when a narrow majority in his cabinet backed Smuts. He started the Afrikaner Party which would amalgamate later with D. F. Malan's ’’Purified National Party’’ to become the force that would take over South African politics for the next 46 years, until majority rule and Nelson Mandela's election in 1994. Although the press had maintained a steady trickle of unsourced exposés of the inner workings and membership of the Broederbond since the 1960s, the first comprehensive exposé of the organisation was a book written by Ivor Wilkins and Hans Strydom, The Super-Afrikaners. Inside the Afrikaner Broederbond, first published in 1978. The most notable and discussed section of the book was the last section which consisted of a near-comprehensive list of 7500 Broederbond members. The Broederbond was portrayed as Die Stigting Adriaan Delport (The Adriaan Delport Foundation) in the 1968 South African feature film Die Kandidaat (The Candidate), directed by Jans Rautenbach and produced by Emil Nofal. Every Prime Minister and State President in South Africa from 1948 to the end of Apartheid in 1994 was a member of the Afrikaner Broederbond. Once the Herenigde Nasionale Party was in power...English-speaking bureaucrats, soldiers, and state employees were sidelined by reliable Afrikaners, with key posts going to Broederbond members (with their ideological commitment to separatism). The electoral system itself was manipulated to reduce the impact of immigrant English speakers and eliminate that of Coloureds. The Afrikaner Broederbond continued to act in secret, infiltrating and gaining control of the few organisations, such as the South African Agricultural Union (SAAU), which had political power and were opposed to a further escalation of Apartheid policies. In 1983 when the Conservative Party was founded with Andries Treurnicht as leader, all Broederbond members who belonged to the newly formed party was no longer welcome in the Bond anymore. Treurnicht, C.W.H. Boshoff and HJ Klopper previous chairmen left the organization. Other members like van den Bergh, H.J. left too. In 1985 the Afrikaner Broederbond realised that change needed to take place in South Africans Politics. Although the government did not talk openly with the banned ANC, it was decided by the organization they should start negotiating. On 8 June 1986 JP de Lange, the then chairman met Thabo Mbeki in New York for a five-hour meeting. It was a meeting held at a conference organised by the Ford Foundation. The meeting was just between de Lange and Mbeki, but at the conference other ANC members Mac Maharaj, Seretse Choabi, Charles Villa-Vicencio, and Peggy Dulany were present. P. W. Botha also left the Broederbond after his retirement. ABSA, formed by amalgamation of United, Allied, Trust and Volkskas banks, the latter of which was established by the Broederbond in 1934 and whose chairman was also the Broederbond chairman at the time. Remgro, formerly Rembrandt Ltd., former holding company of Volkskas. Prof. Theunis Roux Botha Former and last Rector of the Randse Afrikaanse Universiteit. D. F. Malan Former Prime Minister. H. F. Verwoerd Former Prime Minister. J. G. Strijdom Former Prime Minister. B. J. Vorster, Former Prime Minister and State President. H. B. Thom, historian and former Rector of Stellenbosch University. Tienie Groenewald, retired Defence Force general. Barend Johannes van der Walt, former ambassador to Canada. Dr. Pieter Johannes Potgieter Stofberg, former politician, billionaire businessman and famous doctor. P. W. Botha, former Minister of Defence and Prime Minister. He left the Broederbond. Anton Rupert, billionaire entrepreneur and businessman; a member in the 1940s, but eventually dismissed it as an "absurdity", and left the organization. Marthinus van Schalkwyk, former member of the youth wing of the Broederbond, the last leader of the National Party and former minister of tourism in the ANC government of Jacob Zuma. Tom de Beer, recruited 30 years ago, now chairman of new Afrikanerbond. "Lang" Hendrik van den Bergh The South African head of state security apparatus during the Apartheid regime, and close friend of former South African Prime Minister B. J. Vorster.He left the Bond. ^ "Mormonen voor vrede en gerechtigheid – Robert Poort – April 2006". Archived from the original on 9 October 2007. ^ a b c d "Jong Suid Afrika – founded in June 1918". ^ a b c d e Wilkins, Ivor; Strydom, Hans (1978). Super-Afrikaners: Inside the Afrikaner Broederbond. Jonathan Ball. ISBN 9780868500089. ^ Bunting, B. (1969). "The Rise of the South African Reich". African National Congress. Archived from the original on 18 May 2007. Retrieved 12 June 2007. ^ a b van Wyk, AH (2005). Die rol van die verligtes in die Nasionale Party in die politieke ontmagtiging van die Afrikaner, 1966–1994 [The Role of the enlightened ones (verligtes) in the National Party in the political disempowerment of the Afrikaaner 1966-1944] (Masters) (in Afrikaans). University of Pretoria. hdl:2263/28811. ^ Savage, M. "A chronology of meetings between South Africans and the ANC in exile 1983-2000". SAHO. Retrieved 31 August 2018. ^ "African Defence Systems". African Defence Systems. Archived from the original on 1 April 2007. Retrieved 16 December 2017. ^ Fisher, R.C. (2006). "Moerdijk and the shadow of Baker". South African Journal of Art History. University of Pretoria. 21 (1): 70–78. hdl:10520/EJC93926. ^ Jooste, Johan K. (2001). "An appraisal of selected examples of Gerhard Moerdijk's work (1890·1958)". South African Journal of Art History. 15 (1): 68–84. hdl:2263/14438. ^ The Guardian. Monday 23 January 2006. Obituary: Anton Rupert. Tom de Beer on formation of new Afrikanerbond. This page was last edited on 13 December 2018, at 22:26 (UTC).